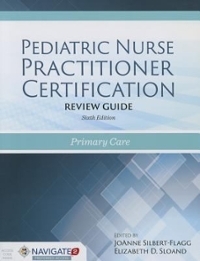 The Xavier University Newswire students can sell Pediatric Nurse Practitioner Certification Review Guide (ISBN# 1284058344) written by JoAnne Silbert-Flagg, Elizabeth D. Sloand, Elizabeth Sloand and receive a $29.04 check, along with a free pre-paid shipping label. Once you have sent in Pediatric Nurse Practitioner Certification Review Guide (ISBN# 1284058344), your Xavier University Newswire textbook will be processed and your $29.04 check will be sent out to you within a matter days. You can also sell other The Xavier University Newswire textbooks, published by Jones &Bartlett Learning and written by JoAnne Silbert-Flagg, Elizabeth D. Sloand, Elizabeth Sloand and receive checks.